Not every machine design conforms to the range of shapes available in our standard Rounthane and Veethane lines. Shingle's Extrusion department has the flexibility to meet the special needs of unusual applications. We will work with your design criteria to produce belting which is individualized and specific to your requirements. 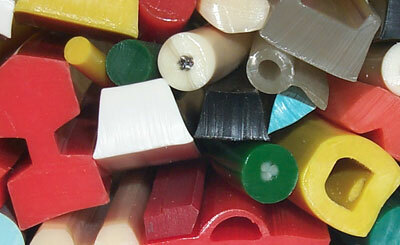 We can extrude products in PVC, Urethane, Polyester, and other resins. Any color can be run and durometers can be varied. Contact our factory for minimum quantities and other details. These drawings represent only a small portion of our custom extrusion capabilities. Inquiries welcome for PVC, Urethane or Polyester. Shingle's Profile Extrusions can be designed to match the OEM specifications.